Growing up in Washington, D.C., I first saw Billy Cobham with guitar virtuoso John McLaughlin and his ground breaking Mahavishnu Orchestra at American University in 1972. After that unbelievable show, Cobham soon became my favorite drummer… He still is. 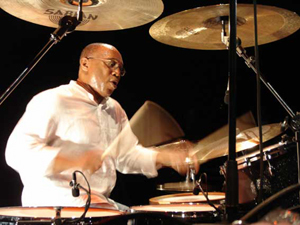 Considered by many to be one of the greatest drummers of all time, Billy Cobham’s prolific career has spanned several decades; from his earliest works with pianist Horace Silver and trumpeter Miles Davis; the Mahavishnu Orchestra, Ron Carter, Randy and Michael Brecker, John Scofield, George Duke, Dexter Gordon and Stan Getz; his work with the Grateful Dead’s Bob Weir and the Dead-inspired “Jazz is Dead”; and last but not least, his many and varied ensembles, from his steel drum-flavored Culture Mix, to his most recent, latin inspired group, Asere. Cobham’s incredible rudimentary skills were second to none; I’d personally seen him over thirty times, and his massive frame and joyous playing will leave anyone who sees him gasping in amazement. Those skills have not diminished one bit, as evidenced in a new DVD, “Billy Cobham: Live at 60”. Joining Cobham for yet another concert in Paris, is his Culture Mix group, featuring the great “Junior” Gill on steel drums. With footage and interviews, this DVD is a remarkable window into the life of perhaps the best drummer of ours, or any generation. Only a few times in history has a musician been singled out as the world-class master of his instrument. Cobham is one of those few artists. For over 30 years, he has received international acclaim as the total consummate percussionist. The legendary Cobham, with his matchless, dazzling, ambidextrous skills as a drummer, has applied the same insistent fervor to his long list of monumental achievements. He’s an accomplished composer and record producer. It is a rarely known fact that he was at the forefront of the electronic music industry and it’s development through Jazz. He was one of the first percussionists, along with Max Roach and Tony Williams to utilize the Electronic Drum Controller made in 1968 by the Meazzi Drum Company in Milano, Italy while on concert tour with Horace Silver in Europe. He is one of the few Percussionists, specializing in the Jazz drum set to lead his own band. The award winning Cobham has custom designed trend setting acoustic and electronic drum sets and has endorsed products that he created and refined. Cobham has performed on hundreds of records with his own groups and with some of the music’s most luminary artists, and his trademark – biggest, fastest, explosive drumming – has energized the international stages of concerts, symphonies, big bands, Broadway, festivals, television and video. He has been a teacher of his artistry, giving drum clinics, conducting workshops and symposiums throughout the world. His stylistic influence, which has literally created a category of music, is an outstanding part of the history of modern music. Since 1980, Cobham has been dividing his time between his home in Zurich and the United States where he lived in New York City and northern California until that time, underscoring his unique internationally influenced origins as a musician. Cobham was born on May 16th, 1944 in Panama, surrounded by talented parents and a brother, Wayne (producer, horn player, MIDI specialist, writer), Cobham’s love for drums was kindled by his cousins who played and constructed steel drums and congas in Panama. Some of his earliest memories are of himself playing timbales. The Cobhams moved to New York City in 1947, when Billy was 3 years old. He had his stage debut in performance with his father at the age of 8. Cobham developed his seriously voracious appetite for drumming in the highly competitive Drum and Bugle Corps. arena with St. Catherine’s Queensmen, prompting him to attend New York’s famed High School of Music and Art to study music theory and drum technique with seminars by such renowned talents as Thelonious Monk and Stan Getz. Cobham remembers “In those days, Jazz was a bit off-limits to students while classical music was preferred by the education establishment. So, of course students craved to meet jazz artists. Cobham’s most notable offerings to fusion jazz are his own 35 recordings beginning with “Spectrum”, which was released on Atlantic Records in 1973 and reissued on compact disc by Rhino Entertainment in 2001. Amid the re-release of Spectrum, Cobham has several projects in the works including “Drum + Voice” (due via Sony), and a range of educational tools he produces through his own company, Creative Multi-Media Concepts. Among the resources is the book “Conundrum”, which is published by Warner Publishing, and a slew of Music Minus One interactive CDs which feature selections from Spectrum and other projects of Cobham’s. Billy Cobham: Live at 60 is a unique moment in time, staged in Paris, France to celebrate the 60th birthday. Surrounded by his band, Culture Mix, Billy takes the viewer through a 75 minute musical experience featuring “Red Baron,” “Dessicated Coconuts,” “Cuba on the Horizon,” and many others. While displaying the virtuosic drumming that Cobham is known for, this DVD puts the viewer right next to Cobham, to share his music, his humor, and his culture as if seated behind the drums along with him. Other featured musicians include percussionist Wilber “Junior” Gill, Marcus Ubeda on the keyboard, guitarist Per Gade, and Stefan Rademacher on bass.